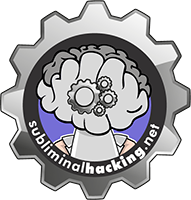 Unfamiliar definitions may be used on the Subliminal Hacking site, so this page aims to define what may be unfamiliar. Social engineering is the art of getting information from people, having them carry out activities, disclosing sensitive information and more, all through manipulation. Hypnosis is a process of concentration, imagination and suggestion. The process allows for suggestions and real or imagined experiences. Somnambulism is someone considered to be a sleep walker. From a hypnotic perspective a somnambulist is an individual highly suggestible and responsive. Catalepsy is the suggestion resulting in a muscle rigidity. Such as a stiff arm, that can not be consciously moved. Analgesia is the suggestion resulting in the loss of sensation. Such as being unable to feel a hand being touched. Neuro-linguistic programming is a process to bring about change in self belief. The art of using behaviour patterns, visually, vocally and conceptually to alter behaviour. Understanding of patterns can also improve communication and perception skills. Framing is the term used in NLP to define a context or perspective. A frame can then be reviewed and understood, and then re-framed to alter perspective and reality. Cold Reading is a technique or method used to convince a subject that you some how know more about them, than they have communicated. This is achieved by using general terms in conversation, reading body language, tell signs and more, to build up a reference and then communicate as a convincer. Mentalism is the performance or effect of combined skills to convince the subject they are able to read minds, foresee the future, control minds, and influence. Someone who practices mentalism is referred to as a mentalist, and they use many skills in their trade, such as NLP, Cold Reading, Hypnosis and more. Visualistic is the term associated with someone who processes memory and thoughts in the terms of images. When thinking about something they will picture the scenario and see it clearly in their mind. Most people are classed in this category. Auditory is the term associated with someone who processes memory and thoughts as sounds and audio. When recalling a memory or a person, they will often hear that situation, or person speaking. Kinaesthetic is the term associated with someone who processes memory and thoughts in an emotional, feeling manner. When recalling memories, they will feel how they felt at the time, and experience the same emotions. Influence is the term associated when one individual is able to convince, or bring another person around to the same way of thinking, or to perceive something the same way.Ã‚ This could be influencing someone to make a desired decision, or to influence belief in an individual being part of a specific group, or expected at a location. Pacing and Leading is a term commonly used with regards to hypnosis and NLP. Pacing is essentially confirmation of what is happening at that moment in time, both physically and mentally. Leading builds on the pacing and verification of fact, to an experience, frame or state you want to move to. Body Language is the term associated with non verbal communication. The whole body is used to communicate, and forms a greater level of communication than just verbal. Limbic System is the term used for the subset of brain that controls functions such as emotion and behaviour. It is via the limbic system body language can reveal what an individual is subconsciously thinking and feeling. Mind Scripts are simple and concise positive statement that it mentally repeated before and during an interaction. The result is a change of attitude, body language, facial expressions and more that would be associated with the desired outcome and beliefs.